CODEP currently employs 600 people that support 3,000. These 600 are divided into roughly 30 sub-groups that work on different sections of the mountains. This year, CODEP is going to be doubling its membership. These groups also manage tilapia ponds. These are fish are used both for consumption and for selling at the market. 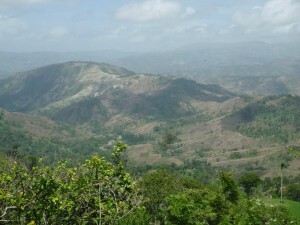 Haiti is 98% deforested as is portrayed here. In order to reforest completely denuded mountains, they first dig long trenches and plant a grass called vetiver below the trench. This grass grows roots up to 5 feet deep and help to retain the soil. Above the trench, a mix of eucalyptus and acacia, which will grow nearly 20 feet in ten years. Once the trees are well established, fruit trees are planted. Each year, CODEP is able to plant between 600,000 and 800,000 trees at less than $1 per tree. This incredible work is transforming the mountains above Leogane. Aid Still Required is currently working on providing Waka Waka solar lights to all CODEP members. The lights were earned from our Haiti 3rd Anniversary social media campaign. In an area where there is very little and sporadic access to electricity, these lights will be a great help. The successes of CODEP are seen here with tilapia farms in the foreground as well. Waka Waka is a Dutch company that is providing incredible solar lights all over the world. Currently, their main focus is Haiti where they are looking to deliver roughly 40,000 lights. Recently, they also delivered tens of thousands of lights to Syria. They function on a “one-for-one” basis. For every light that is purchased by the public, one light is donated. The Aid Still Required Waka Waka collaboration produced 1400 lights for Aid Still Required and our project partners. While we hoped to deliver these lights during our visit to 300 people in Wharf Jeremie including all of the men and women who have gone through the trauma therapy program, customs problems at the port are preventing us from delivering the lights during our stay. We are disappointed but the delivery has been rescheduled for August. 100 lights will also be delivered to the women who have gone through the program in Les Cayes. Check back in late August/early September for photos!